One of the questions I get all the time is “what thermometer should I use?” I find this interesting because it’s amazing how quickly a fairly strait forward aspect of charting your cycles can get so complicated when technology is involved. One of the most exciting aspects of fertility awareness for a science loving nerd like myself is the ability that fertility awareness charting gives me to quantify my fertile signs. I can mark down how much or how little cervical mucus I see on what days, how much my basal body temperature shifts after I ovulate, and then when I’m done measuring I can plot the data on my chart and see exactly whats happening in my cycles. As a Fertility Awareness Educator you can bet your gluten free cupcakes that your chart tells me way more about what’s going on in your body and your cycles than what day you ovulated on. When I look at your charts I see patterns that give me a wealth of information about your thyroid health, your metabolism, and your hormone levels. It also gives me clues about potential gut issues, food sensitivities, illnesses, infections, nutritional deficiencies, and the list goes on. Most women start using fertility awareness to conceive or as a natural method of birth control, but as you can see that barely scratches the surface of what you can learn about your body from charting. With all of the incredibly complex personalized information you can get from your charts you must need a cutting edge, fancy, expensive thermometer to take your temperatures…right? Well, I hate to burst your bubble, but before fertility awareness was as big of a “thing” as it is now, before we had cell phones, fancy apps, laptops, Excel spreadsheets, and Bluetooth thermometers, there were 3 things: your paper chart, a pen, and a thermometer. That’s all folks…and women were able to chart their cycles just fine. One of the things that I love the most about fertility awareness is that no matter what happens in life I’ll still know what’s going on in my cycles. Tornado? Torrential rains? Snowstorm? Zombie Apocalypse? No problem. We’re still good on the fertility awareness front. 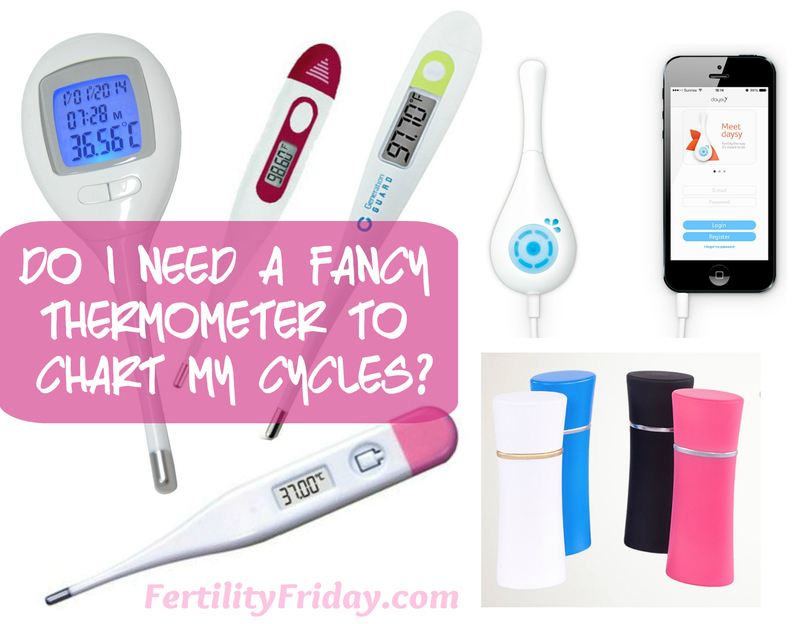 I don’t need a “special” fancy, expensive thermometer to chart my cycles. What kind of thermometer do I need? You need a basal body thermometer that measures to at least 1 decimal place (i.e. 97.6), although 2 decimal places is better (i.e. 97.67). Beyond that it comes down to preference. I’ve found that’s it’s nice to have a few features like having a thermometer that remembers your last reading, and has the ability to change from Celsius to Fahrenheit. If you love tech and you know that having a thermometer that syncs with your phone via Bluetooth will help you record your temperatures, then by all means go for it. But don’t think you need to spend over $100 on a thermometer to use fertility awareness successfully. If you find that you’re spending more than 10 minutes of your precious time deeply contemplating what thermometer you should use just know that you’re overthinking it. It doesn’t have to be that complicated. I find that it’s so easy to focus on the wrong things especially when it comes to fertility awareness. What’s more important than spending hours scouring the web for the “perfect” thermometer is getting an accurate temperature reading each day. Knowing how to rely on your cervical mucus observations so you have something to go on in times of illness, stress, during the postpartum period, and any other time you can’t rely exclusively on your temperatures. Now I recognize that there is a ton of cool technology out there and if it floats your boat to dive in and get all the latest gadgets then by all means, go for it! But, know that you don’t need fancy technology to do this. A thermometer, after all, is a fairly simple device that measures your body temperature. It doesn’t need to be more complicated than that, and it definitely doesn’t need to cost more than $20. Now I want to hear from you. How do you measure your temperatures? What thermometer do you use? Do you love cool tech, or are you happy with a basic thermometer that measures to 2 decimal points? Do you think it matters what kind of thermometer you use to record your basal body temperature? Share your thoughts in the comments below! Hi Samantha, yes having the feature to store past temperatures would be very handy! I started listening to the podcasts last week and have searched around on here for an explanation of how to chart, since the importance of charting is mentioned so many times. Is there somewhere on your site or podcasts that actually says how to make a chart? Is there a template to use? Many thanks for any advice! Thank you so much for pointing me in the right direction! I’ll start with listening to the recommended podcasts and possibly join the group once we start trying to conceive.